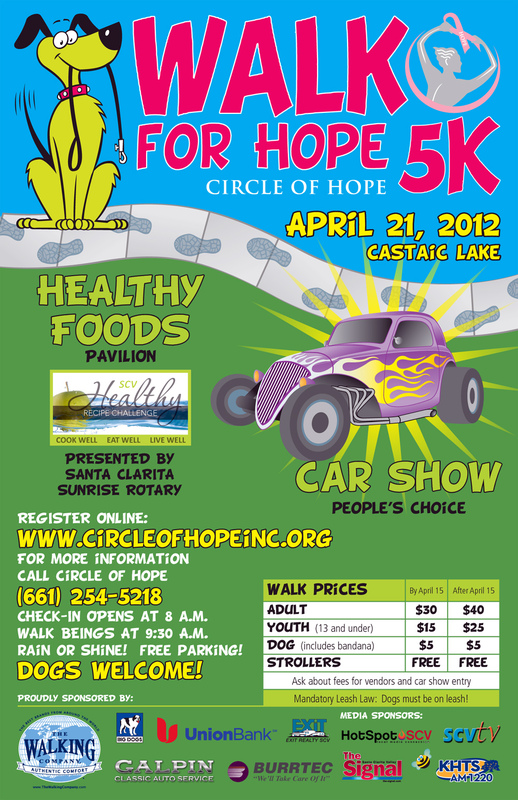 Circle of Hope will hold its 8th Annual 5k Walk and People’s Choice Car show Saturday, April 21, at Castaic Lake. Walk as a team, with family members or even your canine friends in this non-competitive fundraiser benefiting Santa Clarita Valley breast cancer patients. This year, we are proud to have The Walking Company and Big Dog Sportswear as our title sponsors. For the first time, Galpin Ford will sponsor an early morning car rally prior to the walk. Enjoy looking at all the classically restored vehicles in the People’s Choice Car Show along the 5K route, and cast your vote for your favorite vehicle. Also new this year, students who sign up to walk under their school’s name will get 50% of their earned pledges donated back to their school, and the individual who raises the most money from pledges over $500 will win an iPad2! The school who raises the most money will also win a Walk for Hope Perpetual Trophy to display at their school for the year. After completing the 5K route, walkers will enjoy a variety of vendors offering goods and services for their shopping pleasure. Another new element to this year’s event is the Healthy Food Pavilion provided by the SCV Sunrise Rotary, who is sponsoring a healthy recipe contest with categories for different age groups. * When: Saturday, April 21, from 8 a.m. to 2 p.m.
* Dog Registration: $5 (includes a bandana). Dogs must be on a leash. * Info, Pledge Sheets & Registration online at www.CircleofHopeInc.org. **Participants must register by April 15th to receive pre-register cost. Registration includes a T-shirt and parking. Not endorsed or sponsored by the schools or the districts. For further information or questions, please call 661-254-5218 or visit CircleofHopeInc.org. Circle of Hope, Inc., is a 501(c)3 nonprofit, assisting uninsured and underinsured breast cancer patients, their families and the SCV with financial, emotional and educational support services. Federal ID #20-0680327.